Here you can search organizations registered with MEIKAN. You may specify search conditions by clicking "Search organizations". ・You may search by selecting activity types or by keyword. 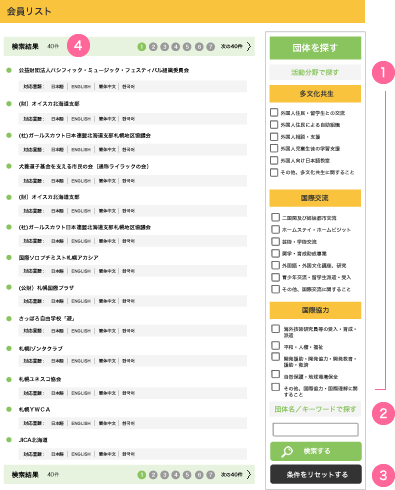 ①	Click the checkbox to the right of the activity type(s) of interest. ・You may select more than one activity type. 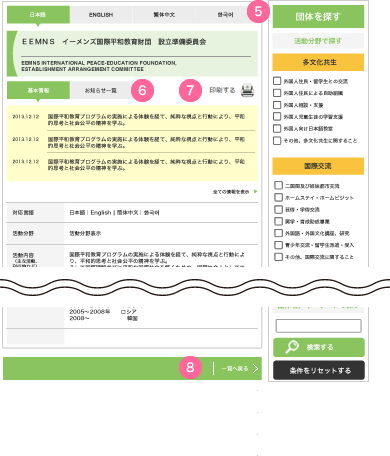 ・If you select more than one activity type, your search will return registered organizations that relate to at least one of the activities you have selected. ②	Click the "Search" button. ① Input a keyword into the entry field. ・The search will return organizations with names containing the input letters. ② Click the "Search" button. the results will contain organizations that fulfill both specifications. If you wish to clear all search terms and see all registered organizations, click the "Reset search terms" button on the right hand side of the screen. Results will be displayed matching specified search terms. 10 results will be show per page. If your search returns more than ten results, click on additional page numbers or "Next 10 results" to see more items. Clicking on an organization name will allow you to view more detailed information. You may access further information and notices of selected organizations. You may view information in another language by clicking the "日本語", "ENGLISH", "中文", and "한국어" tabs at the top of the page. You may toggle in between the "Basic information" and "Notices" tabs found beneath the organization name. Clicking the "Print" button will print the information displayed on the screen. You may return to the search results list by clicking on "Return to list".